WANROOETECH’s PET bottle washing line is the ideal solution for your PET recycling needs. This fully automated washing line takes compacted bales of PET bottles and turns them into clean, contaminant-free PET flakes that can be used in producing polyester staple fiber or pelletized into granules for use in manufacturing other PET products. This is accomplished by the implementation of a series of recycling machinery. Our standard PET washing line ranges from an input capacity of 500kg/h upwards to 3,000kg/h. The output capacity is based on the amount of contamination in the PET bottles you’re recycling. While our standard PET bottle washing line is sufficient for most plants, custom setups with additional machinery and increased capacity can be designed for your specific needs. Please contact us for further information about custom projects. 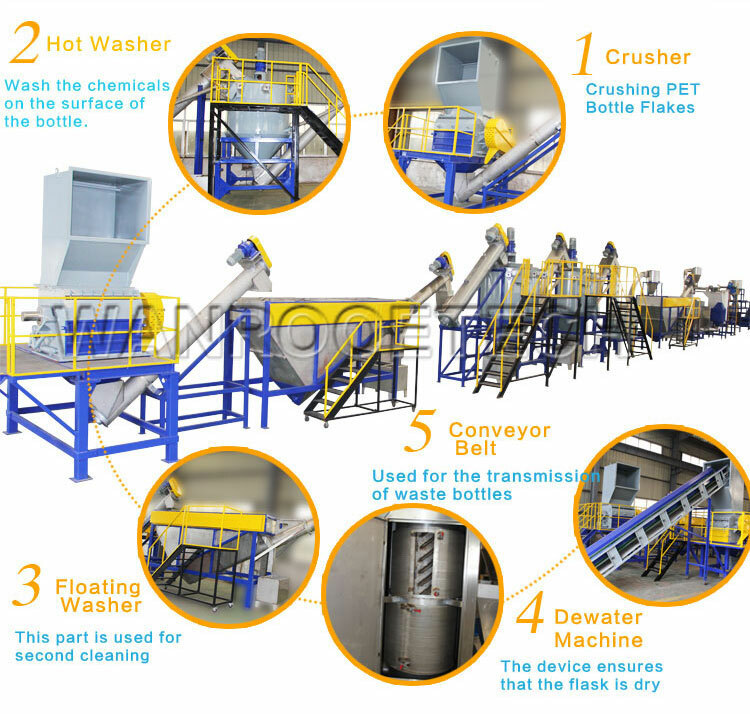 Below is a list recycling machinery used in our standard PET bottle washing line. As PET bottles generally arrive at washing plants in bales, or compacted bundles of plastic bottles, it must first be unpacked before the bottles can flow freely onto the belt conveyor system. Remove small contaminants such as broken glass, paper/cardboard ,metals ,rocks. Remove the label from the bottles. 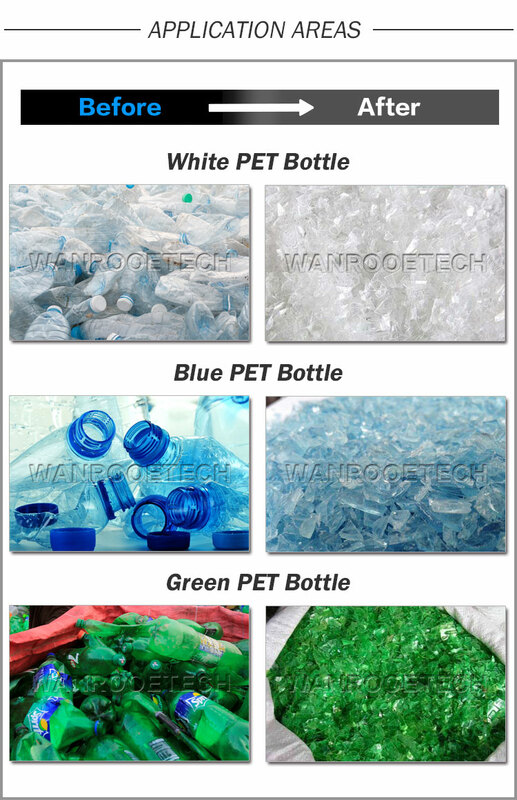 Picking out the different color bottle and also the bottle still have the label, which make sure the end products of PET flakes same color and much more clean. Metal Detector is optional. Using a wet crusher, whole PET bottles are cut into PET flakes between 12-18mm in size. A way to separate materials that float from those that sink, the sink/float separation tank is ideal for PET recycling as PET flakes sink while plastic film, PP/PE bottle caps, and other contaminants float. Using the hot water and chemical to break down the oil and glue on the PET bottles. The friction wash uses high speeds to create friction between the PET flakes where debris is effectively scrubbed off. It used in cleaning pet flakes, make the flakes cleaner and whiter. The dewatering machine uses centrifugal force to spin water moisture off the PET flakes. Using the hot air to take the humidity away from the clean material. 1.High automation level, try best to reduce your cost on labor (especially for three shifts) and ensure high processing capacity: 100-2000kg/hr. 2.Friendly control system (PLC integrated & separated control on each machine) and Touch screen panel, easy for operation, monitor and emergency stop. 3.All parts contacting with plastic material and water are made of high-quality 304 stainless steel; ensure no second pollution to flakes. 4.This China Hot Selling Waste PET Bottle Washing Machine can easily wash and recycle waste PET bottle flakes. Equipment at the end of the washing line so that the completely dry flakes can be collected and packed directly after being washed. 5.The whole production line can be designed on the basis of how dirty the flakes are, and make sure of the quality of the final products. 6.Coordinating the production line with follow programmed work (granulating system), and it will make waste and dirty PET bottles to be the PET granule material and in order to producing new PET bottles. Bottles jars and other containers made of PET can be collected and recycled into a wealth of products. PET can be recycled into new PET bottles and containers, carpet and clothing, industrial strapping, rope, upholstery fabrics, boat sails, automotive parts, fibrefill for winter jackets and sleeping bags, construction materials, and many other items.